pickup truck and went racing. Simplicity at its finest. storage unit. It has no electricity, no refrigerator, no indoor plumbing. and the bike and truck go back to my condo for a sleepover in the city. Off-Road Racing Association’s MXC series near Prophetstown, Illinois. nephew could do it better, using only his left thumb and eye teeth. the Peat Capital of the World and home of the Moose Run. Prophetstown soil has a sandy flavor uncommon to most of Illinois. our sport is not for the meek or the thirsty. until noticing that most of the front fender cards read “Pro” at the top. the Pro’s; old guys are behind us.” I moved to the second row. The new KX sprang to life with relative ease when the flag dropped. go and sprinted to the first corner with only 4 or 5 guys ahead of me. minutes, in which time I passed one guy and got passed by another. double, but the space in between was mostly filled in with sand. Barely a double; not quite a tabletop. Moose Run it was not. stumble, a minor tip-over in a narrow off-camber section. heavy enough to rattle my jaw. I’m sure it was a crowd-pleaser. Lap times were 12-13 minutes, which put me on pace for 7 or 8 laps. I felt like an old guy. A really old guy. game in April: most days, you’re going to get cold or wet (or both). course was a cold, continuous 3-mile rut, just like last year in May. 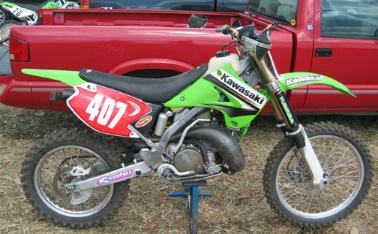 day, my KX250 would use all five of its gears and beg for a 6th. separating the two of us. This time, I didn't look back. few seconds, I caught up and fell in line with the lead group. left him in my roost. managed to whack the guy’s arm with my handguard. career. Expectations for Colona were wrong, gloriously. 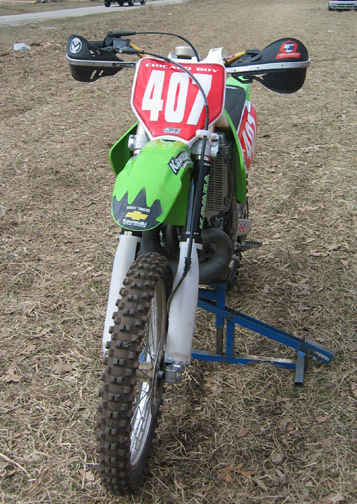 up exactly like the '03 KX250.